Rain bracketed both ends of Maryland International Raceway’s Fast by Gast Superbike Finals but failed to derail the event completely. Fifteen inches swamped the Budd’s Creek area in the days leading up to the race, forcing event manager Jason Miller to extreme track overhaul measures on Friday. He promised a fast track and the MIR staff delivered. 466 racers ignored the weather to compete at MIR’s last Mickey Thompson Performance Tires MiRock Superbike Series race of the year and set 6 new records along the way. For the second straight race, class newcomer Johnny “Turbo” Dobrin qualified number 1 in HTP Performance Real Street, this time with a 7.924. Points leader Jeremy Teasley and the Adams Performance/RS Motorsports Kawasaki ZX14 were way down the ladder in 15th. But Teasley and the team found their groove on raceday and Jeremy beat teammate Mark Billiter in the semifinals. Dobrin beat fellow turbo campaigner Michael Glace in the other semi, and he and Teasley will race for the spoils at the series finale in Rockingham on November 6. Dobrin also set the turbo Real Street MPH record over the weekend, but Teasley clinched the Real Street points championship. Ashon “Capo” Dickerson won Real Street B.
Orient Express Pro Street number 2 plateholder Rodney Williford qualified number 1 in that class with a 7.15 at 203—gobs quicker than the 23 other entries. But Williford redlit to Mike Slowe in round 2 of eliminations. Slowe then beat Mike “Dead Heat” Claycomb in the semi. National record holder Bud Yoder beat Rob Budgell in a Michigan grudge match in the other semi before the rains came. Neither finalist can make the November MiRock final in North Carolina so they split the purse. Teasley’s nitrous huffing Pro Street Kawasaki ZX14 encountered a litany of problems as he aimed for the 7.0s and beyond. Jeremy, who recently was hoping to add a Pro Street championship along with his Real Street crown, failed to make the field by .03. 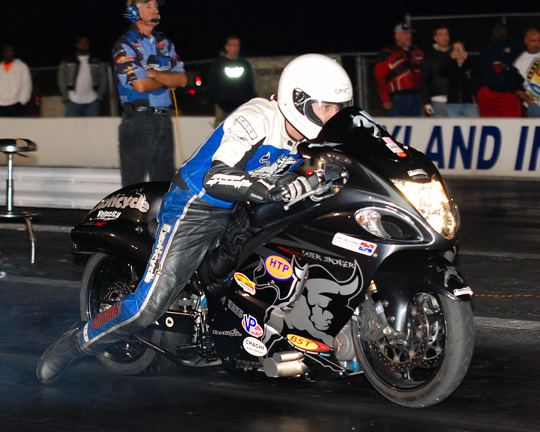 Ehren Litten beat Ed Noll in the Pro Street B final, and Ryan Schnitz set the nitrous Pro Street MPH record on the HTP Performance Hayabusa. 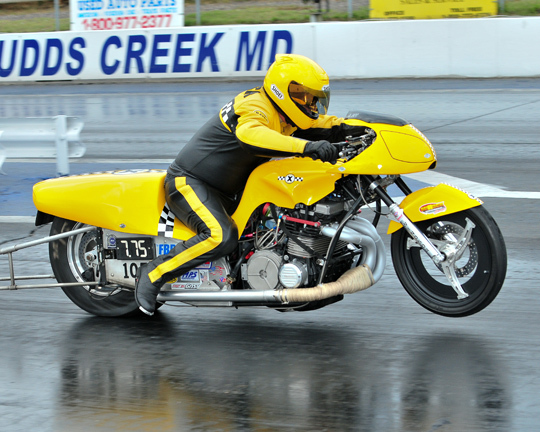 Maryland native Ronnie Procopio out-qualified 22 other bikes in Pro Comp, the eighth mile class for nitrous Pro Mods, turbo Funnybikes and nitro Harleys. Procopio pushed his nitrous Suzuki to a 4.103 at 170.64 mph, but was nailed to the tree in the semis by multi-time Funnybike champ Keith Lynn, who won on a holeshot. Mark Paquette, also on a turbo Funnybike, beat Frank Christian in the other semi before the rain came. Since Pro Comp doesn’t run at Rockingham, the two finalists split the purse. Procopio, Lynn, and Jamie “Track Star” Emery all set records with their various combinations. 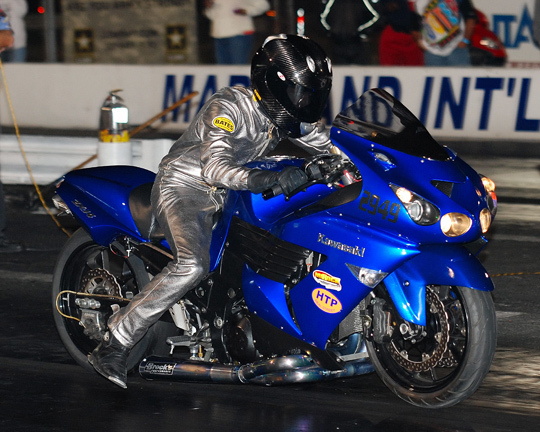 Superstar Rickey Gadson qualified number 1 in House of Speed Crazy 8’s with an 8.883. Rickey took out points leader Eddie “Who” Chapman in round 2, thus increasing his own championship hopes. Sadly, the 47 strong field was halted then by the weather. Gadson and the other 11 riders left in split purse and points. Jay Windsor qualified number 1 against a whopping 159 FBR Shop Quick 32 bikes, a field that finished with an 8.29 bump spot. Windsor was still alive when the rains came, as were Bobby Woolfolk, Chris Clontz and points leader Boo Brown. Those veteran racers split the purse and the points. Michael Rankin beat Kip Green in Saturday night’s Fast By Gast Pro ET race, and Sunday’s race was halted after round 2. Tyron Davis beat redlighting Darrell Mahoney in Saturday’s Schnitz Racing Street ET race. Sunday’s race only made it past round 1. 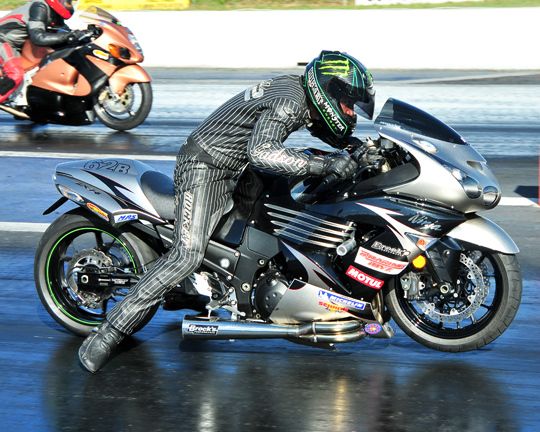 The Mickey Thompson Performance Tires MiRock Superbike Series finishes out the season November 6-7 at the Lee’s Performance Finals at Rockingham Dragway in North Carolina. That last chance event of the year is always off the hook with huge fields and festive Carolina crowds—the perfect setting for ending points battles and settling grudges.